A simple error to make when sending an email with sensitive data is to send it to the wrong email address. Imagine you are sending some information to Dave down in accounting. When you fill out the email you start typing Dave and the auto-complete pops up and you select the first one (out of habit). You think you have selected the right Dave, but what if you didn’t? How would you know that you were about to send potentially sensitive information outside of the organization? 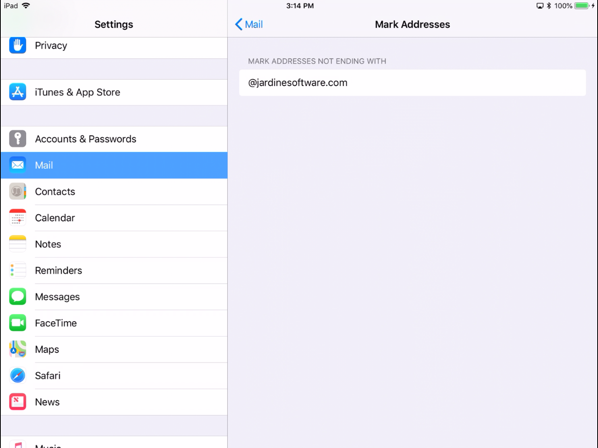 Apple Mail and iOS mail has a built in feature to highlight any email address outside of a specified domain. The steps to enable this are a little different based on the desktop vs. an iPad/iPhone. Let’s look at each one. To change this, in the Mail program, go to Preferences…Composing. 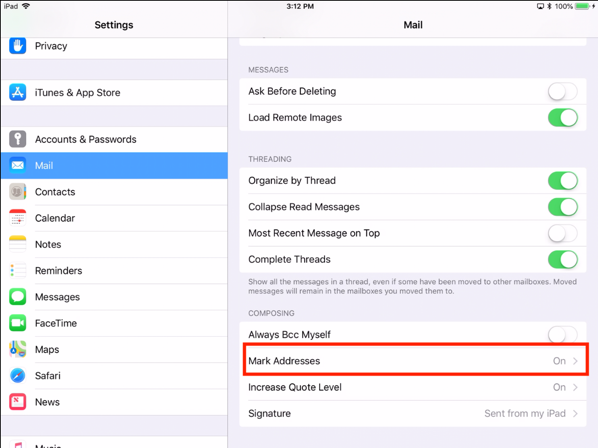 Under the Addressing: section there is a checkbox for “Mark addresses not ending with“. Check the box and enter your organization’s domain name in the text box. In the image below, I have entered my domain of @jardinesoftware.com. Now, go back and compose a new message entering in an email address that is in the org and one that is out of it. The email address that is outside of your domain should be highlighted in red. The below image shows my configuration with the same 2 email addresses. 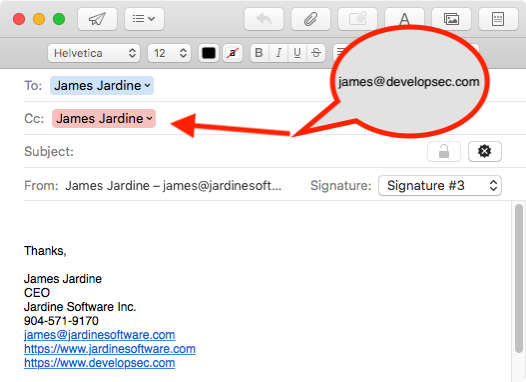 Notice that the james@developsec.com address is now listed in red indicating it is external to my organization. 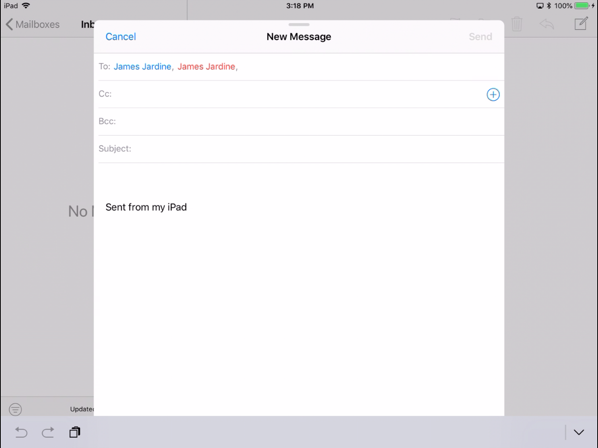 The mail application with the iPhone/iPad also has this capability. To enable this, go into Settings->Mail. 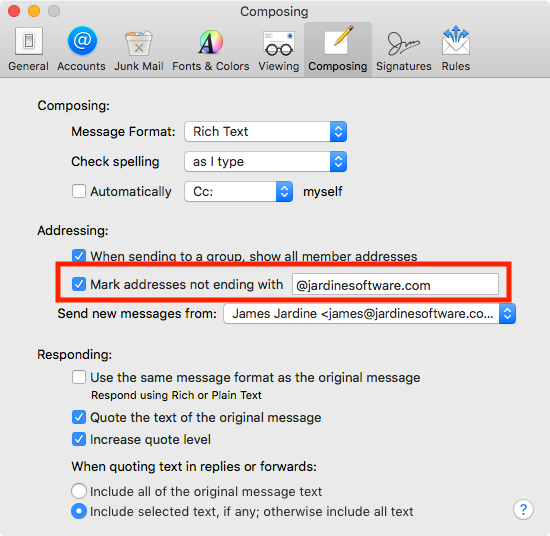 Scroll down to the Composing section and click the “Mark Addresses” button (shown below). Although this is not a fool proof way to stop this type of mistake, it does add in a visual clue that just might catch your attention. Simple changes like this can help reduce your risk of accidentally leaking sensitive information out of your organization. The OWASP Top 10 is on a three year update cycle. We had the list in 2010, 2013 and now the latest is 2017. You may be wondering why it is 2017 rather than 2016. I think that is a question a lot of people had. In any case, the list made it out to final release after the initial draft was rejected. Now that it is here, we can analyze it and see how it affects us and our organizations. I find these items interesting because I see them on most of the assessments I do. Let’s take a quick look at them. CSRF can be a pretty serious flaw based on its context. It is the ability to force the victim’s browser to make requests to another site they are authenticated too without their knowledge. An example of a higher-risk context is the ability to change the victim’s email address on their profile. If the system doesn’t have two factor authentication or other safe guards, changing the email address can lead to the ability to request a password reset. In many situations, this can lead to easily taking over the victim’s account. This is just one example of how CSRF can be used. The good news is that many newer frameworks provide some level of CSRF protection built-in. So in many applications it is not as prevalent. However, based on my experience, not everyone is using the latest frameworks. Due to this, I still find this on a lot of the assessments I do. Unvalidated Redirects is often viewed as a low risk issue. In many cases, it may represent a low risk. There are some situations that make unvalidated redirects fairly dangerous. A good example is the redirect often performed by login forms. A common feature of many applications is to redirect the user to a specific resource after logging in. To do this, a parameter in the URL specifies the path to be sent to. If the application allows redirecting to external sites, it is simple to set up a malicious site with the same look and feel as the expected site. If the victim uses your link with the reference to your malicious site they may be presented with your fake login page after successfully logging into the real site. The victim may believe they have mistyped their password and just login again without checking the URL, leading to account takeover. We also saw to access control findings get merged into one. This change makes a lot of sense when you look at each item. They are both regarding access control issues. XML External Entities is a vulnerability that takes advantage of how XML Parsers interpret the supplied XML. In this case, it is possible to reference other resources outside of the XML document. A common scenario is the ability to read other files on the web server, such as the /etc/passwd file. This vulnerability also may allow a denial of service attack to occur due to embedding specific entities. This vulnerability obviously relies on the application parsing XML data. If your application is parsing XML, it is recommended to make sure the parser is ignoring or blocking DTDs. If your parser doesn’t have that option, or you need to allow some DTDs, make sure your input validation is limiting those to only acceptable ones. Insecure Deserialization occurs when you are deserializing data that has not been properly sanitized. This occurs because we assume that the data serialized has not been modified. When the data is modified, it could be executed during the deserialization process to perform commands. To help prevent this, make sure you are enforcing strict data checks on the objects that have been serialized. I do not see this very often in many of the assessments I do. Just depends on the application as many do not use much serialization. When I talk to people and ask them about logging, the first response, or usually the only response, is related to troubleshooting. There is no doubt that troubleshooting is critical for any application. If the application is not running as expected, users may leave, transactions may get lost, or a myriad of other issues may occur. Logging is for much more than just troubleshooting. Proper logging of security related events can help identify an attack while it is occurring as well as help identify what happened after the fact. It can be very difficult to identify what data was accessed or how if there are no logs indicating such information. It is good that we are seeing more attention called to this practice, although it can be a complex one to implement and verify. Don’t forget that once you start logging security events, they must be monitored to take action. Changes to the OWASP Top 10 isn’t something new. We know it will happen and it may require some adjustment to what we are doing internally. While we do see items drop or get added, it just highlights that the top 10 is a mere starting point of security. Every organization should have their list of top 10 risks. Don’t limit yourself to these short lists. They are to help identify the highest risks and implement them in a feasible way. Application security doesn’t happen overnight. There has to be a starting point and then a path to mature. Two-factor authentication, or multi-factor authentication, is a valuable step in the process to protect accounts from unauthorized users. Traditionally, we have relied just on a username/password combination. That process had its own weaknesses that many applications have moved to improve. For example, many sites now require “complex” passwords. Of course, complex is up for debate. But we have seen the minimum password length go up and limitations on using known weak passwords go up. Each year we see lists of the most common passwords to not use, some being 123456 or Password. I hope no one is using these types of passwords. To be honest, I don’t know of any sites I use that would allow this type of password. So many these days require a mix of characters or special characters. The above controls are meant to help reduce the risk of someone just guessing your password, there are other controls to help try to limit brute forcing techniques. Many accounts offer account lockout after X number of invalid attempts. There are other controls that we also see implemented around protecting the username/password logic. None of these controls help protect against a user reusing passwords on another site that may be compromised. They also do not protect against a user falling for a social engineering attack to trick them into sharing their passwords. To help combat this, many sites will implement a second factor beyond username/password. The idea of the second factor is that even if you have the username and password, you will not have this other piece of information. In most cases, it is a value that changes every 60 seconds or so, and is delivered over a protected channel. For example, the token used may be sent via SMS, a voice call, or created through a phone application like the Google Authenticator application. So even if the attacker is able to get your password, via a breach, brute force, or just lucky guessing, in theory they would not have access to that second factor. Why Are People Not Using It? So why do people not enable the second factor on their Google accounts? Unfortunately, the presentation didn’t appear to explain that, which makes sense since it is difficult to know why people do or do not do certain things. I think there may be a few reasons for it that we will briefly touch on. First, I think many people just are not aware of enabling the second factor. To be fair, it is sort of buried down in settings that may be difficult to find if you are not really looking for it. If it is not front and center, then there is a much smaller chance people will go seeking it out. To add to the issue, many people really don’t understand what 2-factor authentication means or how it really helps them. Sure, in security we get it, but that doesn’t mean everyone else does. How do we make it more prominent that this is a positive security feature? Many users will already be aware of 2-factor if they use online banking as most of those have started enforcing it. Many people think that two factor authentication is a burden or it will slow their access down. This is usually not the case unless the application has implemented it poorly. Many sites will allow you to save your computer so you don’t need to enter the 2nd factor every time you access the site. However, it will require it if you access from a different computer. 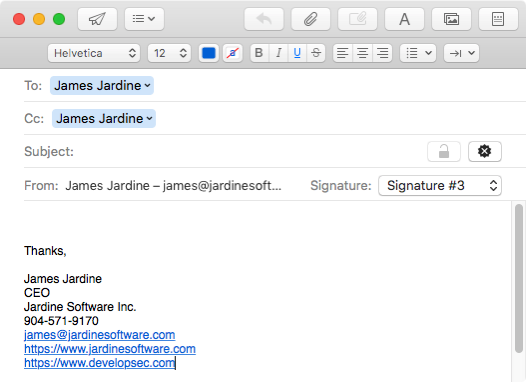 To complicate things, other applications may not support signing in with 2 factors, like your email client. In these cases, you have to generate an app password which can be very confusing to many users, especially those that are not technically savvy. There may be a chance that users don’t think they need to protect their email accounts, that it is not sensitive. If you just use email to communicate with friends and receive junk mail, what could be so bad, right? Most people forget that things like password resets are performed using an email account. Having control of an email account provides a lot of control over a lot of things. While it may seem small, email is an important function to protect. If you are developing applications, I recommend looking into providing the option of 2-factor authentication. When you do this, make sure that you are promoting its use in a positive way. If you already have 2-factor with your application, can you run a report to determine what percentage of users are actually using it? If that number is low, what steps can you take to increase them? Don’t assume that any application is not worthy of the extra security. Many applications are already providing 2-factor and that number will just increase. While we still have the password, we will always be looking for ways to add more protection. When implemented properly, it is simple for the end user, but effective in increasing security. If your user base is not taking advantage of the option, take the time to assess why that is and how it can be improved. As I was writing this up, I ran into an interesting situation with 2-factor that sparked some more thoughts. When looking to support 2-factor authentication and not using SMS, take careful consideration to the applications you may choose to support. On the Apple App Store alone there are over 200 different authenticator apps available. Some are interchangeable while others are not. This can be another barrier in users choosing to enable 2-factor authentication.